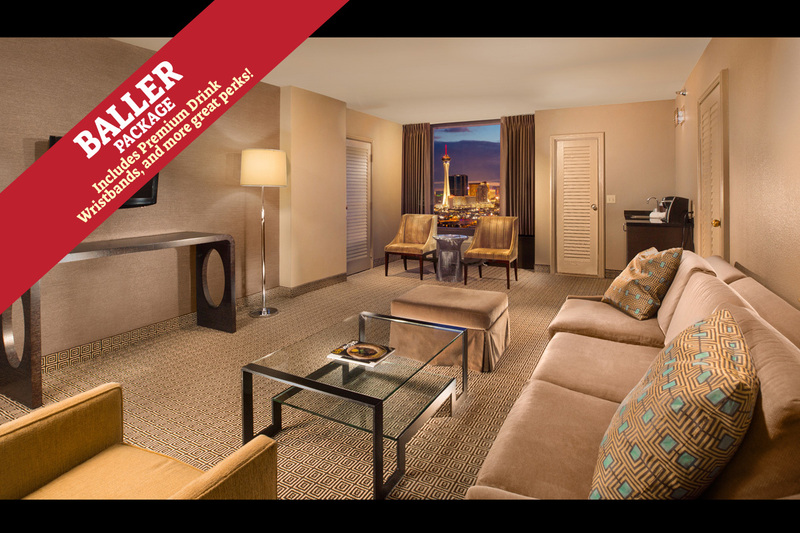 Escape to your Baller 2 bedroom suite and experience fabulous views of the Las Vegas Strip, Fremont Street/pool, or the living room parlor with bar refrigerator. Along with a separate bedroom, these suites come with an additional powder room for more “getting ready” space in the room. The in-suite amenities include a 32-inch flat screen television with premium cable channels and pay-per-view options, Keurig coffee maker, Wi-Fi, an in-room safe, AM/FM alarm clock radio, iron and ironing board, hairdryer, and bath amenities. Select King Bed or 2 Queen Beds at checkout. If you do not see a specific bed type or smoking preference, it is NOT available. Contact Support to add a Baller to your reservation (includes hotel, four day music wristband and all perks) -$1199.00 + $35.91 9% Live Entertainment Tax. and will appear at checkout.